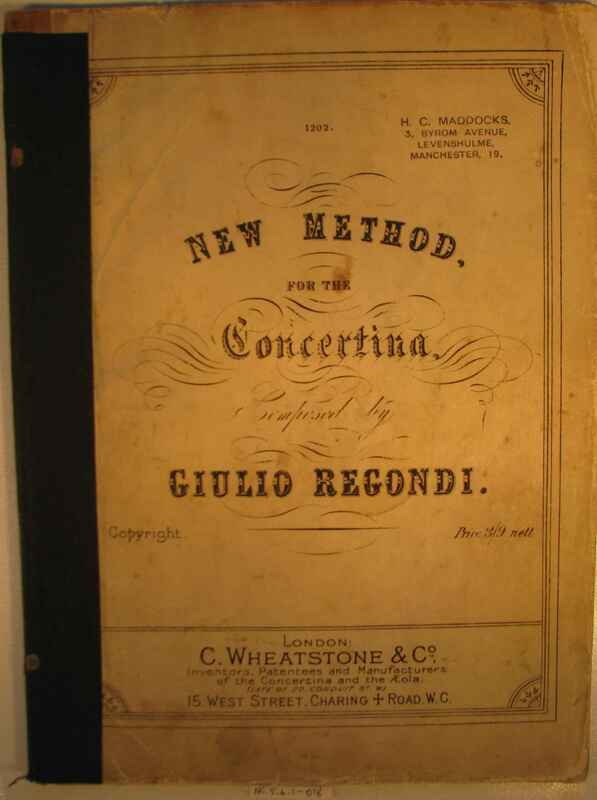 Full Description: ‘English’ Concertina Tutor: “New Method for the Concertina composed by Giulio Regondi” Published by C Wheatstone & Co at 15 West Street, with Late of 20 Conduit Street, W.”) in the address. CW Publication No 1202, a later edition of one of Wheatstone’s earliest Tutors, also published by Joseph Scates, Dublin: 1857; and Wessel & Co. London: in 1857. Regondi (1822/23-1872), a child prodigy on guitar, became the unrivaled classical concertina virtuoso as well as a classical guitar master. He was a prolific and highly acclaimed composer and arranger of classical music for concertina and a teacher of the instrument.